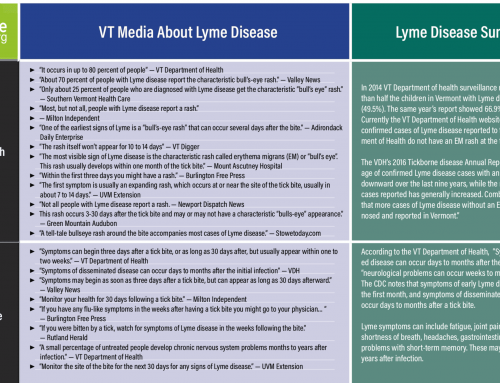 More people are aware of Lyme disease, but did you know there are other tick-borne diseases present in Vermont? 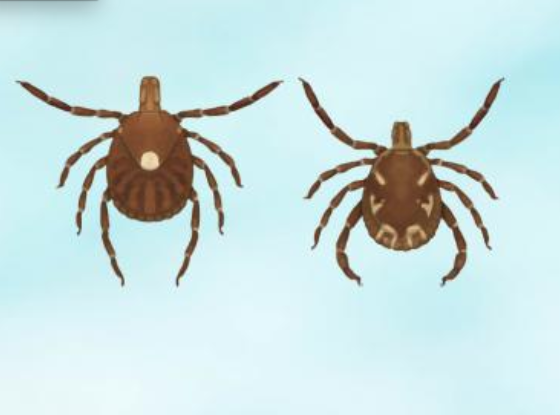 According to the Vermont Department of Health, it is possible to contract Anaplasmosis, Babesiosis, Borrelia Miyamotoi, Ehrlichiosis, and Powassan Virus from a tick-bite here in Vermont. These illnesses might coexist with Lyme disease, which is why they are sometimes called “co-infections”. 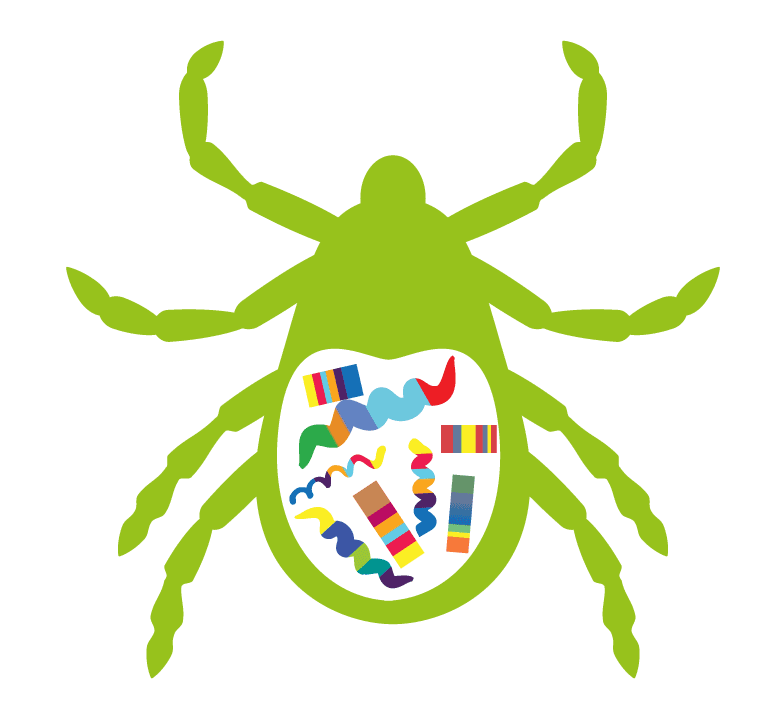 A test for Lyme disease will not show if you have Babesia, Anaplasmosis, or another co-infection. 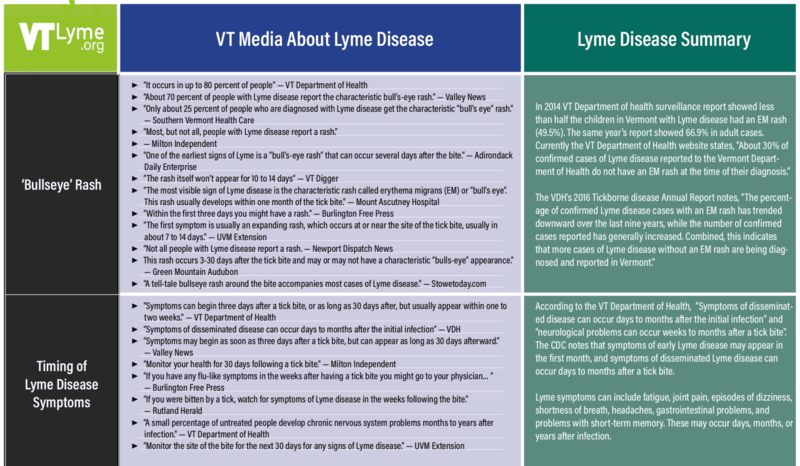 Some of these co-infections require different medical treatment than Lyme disease, so health care providers in Vermont need to be aware that co-infections exist, and consider co-infections when someone does not respond to treatment for Lyme disease. The Vermont Agency of Agriculture’s research shows Anaplasmosis is present in 7% of Vermont ticks. Approximately 1% tested positive for Powassan Virus, and just under 1% were positive for Babesia microti. 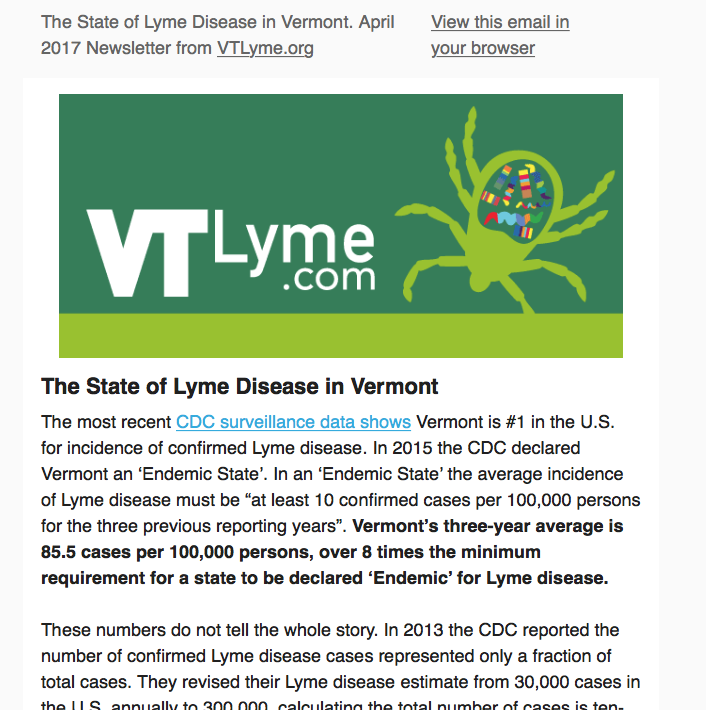 52.9% of Vermont ticks tested positive for Borrelia burgdorferi, the bacteria that causes Lyme disease. Anaplasmosis is the second most commonly reported tick-borne disease in Vermont. 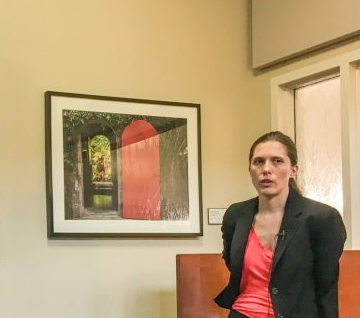 The most common Anaplasmosis symptoms reported in Vermont residents include fever, malaise, muscle aches and headaches. It can also cause nausea and vomiting. Babesiosis is a parasitic disease. 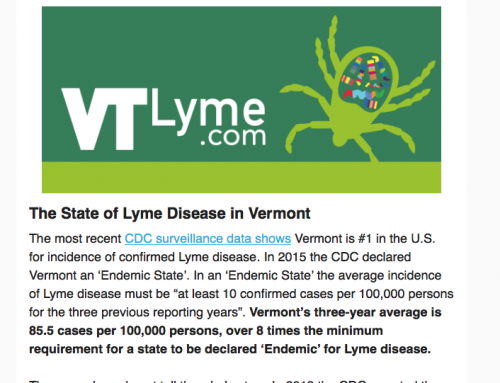 It is the third most common tick-borne disease in Vermont. 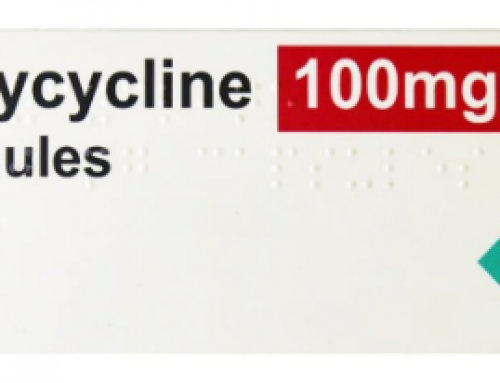 Sometimes a Babesia infection will not cause any symptoms, but those who do experience symptoms may have fevers, chills, sweats, headaches, body aches, nausea, fatigue or other complications. Babesia can be diagnosed with a blood test. Ehrlichiosis is caused by infection with Ehrlichia bacteria. 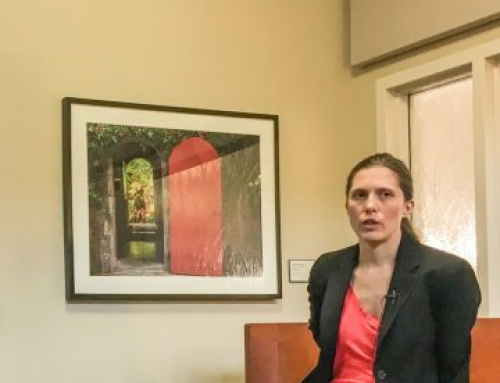 According to the Vermont Department of Health, “It is a serious disease that can be fatal if not treated appropriately.” Ehrlichiosis symptoms include fever, headache, chills, malaise, muscle pain, confusion, red eyes, nausea, vomiting and diarrhea. A skin rash is not a common symptom of ehrlichiosis, but some people infected with Ehrlichia may develop one. The rash is more common in children with the disease than with adults. 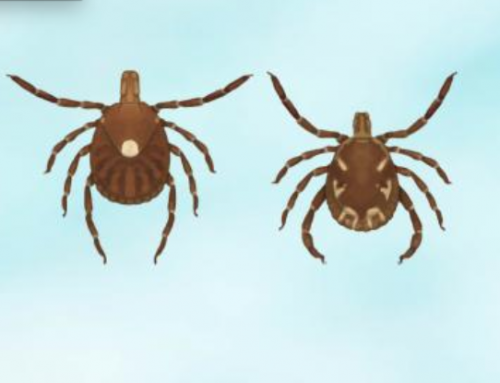 Powassan Virus is present in a small number of ticks in Vermont. Powassan virus may cause fever, headache, vomiting, weakness, confusion, seizures, memory loss, and long-term neurologic problems. People experiencing a severe illness often need to be hospitalized to receive respiratory support, intravenous fluids, or medications to reduce swelling in the brain. 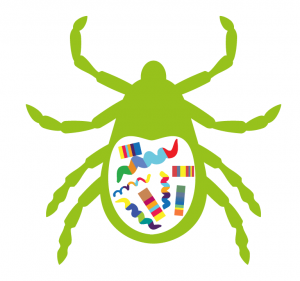 Prevention is key to avoiding a tick-borne disease. Always follow basic prevention protocols, including regular tick-checks, wearing insect-repellent, and putting gear and clothing into a dryer on ‘high’ for ten minutes after returning from outdoor activities in areas where ticks are present.